Whereas a flag state grants a vessel its nationality and therefore exercises sovereignty on board, a coastal state enjoys sovereignty in its territorial sea and jurisdiction in regard to pollution matters in the exclusive economic zone. 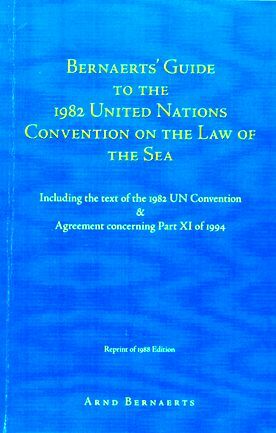 During the last few decades, coastal states have become increasingly reluctant to accept common flag state jurisdiction and the consequent problems of enforcement and have sought more influence and control in pollution matters related to navigation, effective exercise of jurisdiction, and rights for prevention measures. The Convention therefore obliges shipping states to establish international rules and standards through competent organizations or diplomatic conferences. As far as agreements and standards have been established and practiced, they form the backbone of a legal framework for prevention of pollution. 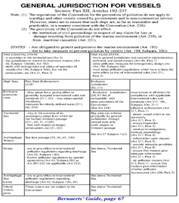 The Convention provisions in this Part contain the general principles, which the legal framework is to apply and according to which it will, if necessary, be re-examined from time to time. The basic principles of the 1982 Convention concerning pollution matters provide that the primary responsibility for establishing measures for the prevention of pollution by vessels lies with the flag state. The flag state is to adopt laws and regulations for the prevention of pollution which are to have at least the same effect as generally accepted international rules and standards established through the competent organization (competent organization here means - International Maritime Organization - IMO -) and take measures to ensure to the fullest possible extent the safety of operations at sea, including the regulation of design, construction, equipment, operation and manning of vessels, prevention of accidents, and prevention of intentional and unintentional discharges, and is to provide emergency measures. 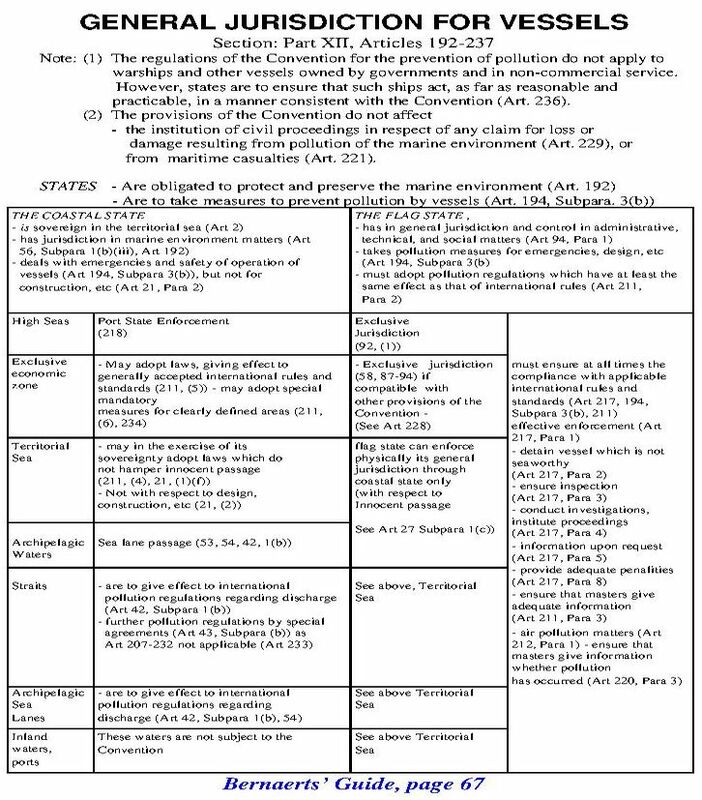 As the coastal states which co�operate in regional pollution prevention agreements may require information from foreign vessels navigating in their territorial sea, the flag state is to ensure that the master of a vessel flying its flag furnishes information as to whether his destination is a port of that region and, if so, whether his ship complies with port entry requirements. There is further the obligation to render information required in order to determine if a violation has occurred. In exercising sovereignty in the territorial sea, the coastal states can take measures in regard to accidents, emergencies, safety of operations and discharge, and so on, except with respect to design, construction, manning, or equipment of foreign vessels on innocent passage. National measures may not hamper the right of innocent passage through the territorial sea. Where a ship is exercising its right of transit passage through straits, the bordering states may adopt laws only in respect to discharge of oil and similar substances and can only in part apply the provisions of Part XII. Archipelagic states, on the other hand, can apply Part XII for vessels in archipelagic sea lane passage, but in adopting laws have to keep in mind that the regulations for sea lane passage refer only to discharge. For its exclusive economic zone, a coastal state may adopt only laws which give effect to generally accepted international rules,  but may also tighten such rules for a particular, clearly defined area of the exclusive economic zone and in ice-covered areas.